Who wants to have a cannonball competition right into this bowl of chili?! It might be a bit warm but we can sit on an avocado raft and eat tortilla chips until we make our way to the edge. I’m all for this idea. Chili swim. Especially THIS chili swim. It is so freaking delicious. 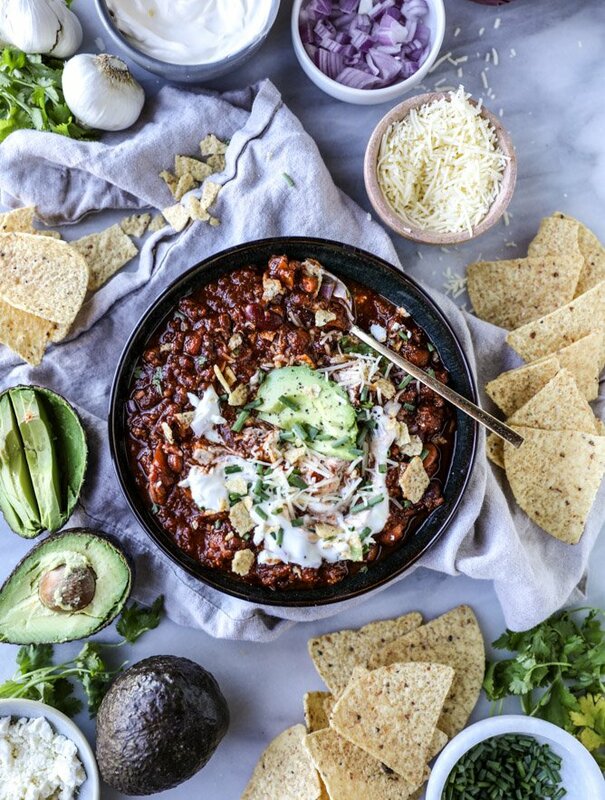 This chili comes from Ayesha Curry’s new cookbook, The Seasoned Life, and it is seriously FANTASTIC. Like, unexpectedly fantastic. We loved it so, so much. It’s no secret that over the last seven years I’ve made (and shared) tons of chili. Really. A TON. And it’s also no secret that every single time I make chili, I never follow a recipe. Never. Not even with my own. 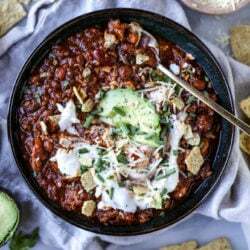 (Okay wait I’m lying – always with this smoky chicken chili.) But I really love to make and taste and season as I go with chili. It depends on the day, my mood, what we’re making it for, what I have on hand and what we feel like using. Yes, making chili in this house may just be a wildly dramatic event. So it came as a surprise to even me that I followed the recipe. I almost followed it to a T. Just a few easy changes (I used beef instead of lamb and decreased the amount of cinnamon) and guess what? I might be using this chili recipe for the rest of my life. It was that good. Holy cow. I was looking through Ayesha’s book trying to decide on a recipe to make and I quickly scanned the chili. I loved that her version used tons of beans (especially pinto! major bean fan here), included sausage in the recipe (yes, I know, I don’t even like sausage! ), included an entire bottle of beer (oh yes) and get this – included MAPLE SYRUP!! Yep. Maple syrup. The moment I saw that, I was like… it’s happening. I have to make this right now. And that’s what I did. Eddie and I both loved that this chili is hearty and not very saucy or soupy. That makes it an excellent chili topping for things like burgers or hot dogs or nachos (I may have had the latter last night… oops) and makes it super easy to scoop up with a tortilla chip. Priorities, man. Aside from those obvious wins, it tasted really freaking good. I’ll be honest. I was hesitant to use the maple syrup, even though I was excited and intrigued about the addition. I thought it might be way too sweet or take away from some of the smoky flavor. It didn’t do that at all. It was the perfect accompaniment to the beef, sausage, beer and crushed tomatoes. changing chili since it’s some of the best I’ve had AND the recipe that made me use a recipe. I don’t even know who I am anymore. Not complaining one leeeeettle bit. Heat a large pot over medium heat and add the olive oil. Season the beef and sausage with a sprinkle of salt and pepper. Add the beef and sausage and cook, stirring often, until browned and golden, about 8 to 10 minutes. Remove the meat with a slotted spoon and place it on a plate. Set aside. Reduce the heat to medium-low. Add the onions, peppers, and garlic, stirring well to coat. Add a pinch of salt. Cook until softened, about 5 to 6 minutes. Add the tomato paste, chili powder, cumin, oregano, paprika, cinnamon and chili flakes and stir and mash it into the pepper and onions. Cook, stirring often, as the tomato paste begins to get darker in color – about 5 minutes. Add the beef back into the mixture. Pour in the bottle of beer to deglaze the pan, using a wooden spoon to stir any browned bits off the bottom. Add the crushed tomatoes, fire roasted tomatoes, beans and maple syrup. Bring the mixture to a boil. Reduce it to a simmer and cook for at least one hour, or until it’s thickened to your liking and the flavor has developed. p.s. I like a bit of chili with my chips. Weekend Photo Diary: Our First Time Apple Picking! Looks delicious! What kind of beer do you recommend using? Something light, or dark? I liked this recipe a lot, so I decided to enter it in my employer’s chili cook off. Scores were given for color, aroma, taste, texture, and spice. Out of 18 tasters, my average score was 71%. The highest score I received was 92%, and the lowest score I received was 44%. Out of 10 pots of chili, this one was ranked right near the middle. Personally, I really like the distinct taste this recipe has. It is a great take on sweet and spicy, and separates itself from the generic / standard chili taste, but not so much that it does not fit in with the other chilis at the party. 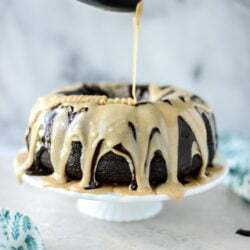 I plan to make this next week but there are lots of vegetarians in my family, how should I adapt the recipe (minus not using meat)? Thank you!!! hi liza! this recipe is pretty meat heavy and reliant on the meat for flavor. if you want to make a veggie one, i’d use a totally different recipe (i have a veg one right here! http://www.howsweeteats.com/2012/10/three-bean-chili-pot-pies/) and if you really want to try the beer and maple syrup flavor, i’d add 1 cup of beer and start with 2 tablespoons maple syrup and taste from there, adding more if you’d like! Thanks so much for responding so quickly, so excited to try the veg chili! Hey I just wanted to let you know that I’ve made this one vegan several times with absolutely no problem. I just used textured vegetable protein. It’s found in a bag from Bob’s Red Mill in the health food section of an average grocery store. It’s shelf stable so check near the flours. You could also use veggie crumbles as well from the freezer section, but it will cost more. My boys are not big chili lovers. Very picky. They usually pick all the beans out. This time I said “just try it before picking it apart.” Hesitantly, they agreed and then I couldn’t hold them back. They were digging at it from the pot with chips. I thought Wow!! Finally, a winner with the kids who hate everything. Thank you! Oh yeah! I’m eating this this summer. Your skin looks lovely, no matter what terrible, horrible things you say about it — perhaps it thrives on pretzel bread and carbonara. BEST chili I’ve ever eaten or made!!!! Truly delicious!!! THANK you for sharing! Outstanding, thank you!! Probably my favorite chili I’ve ever made. Let this one cook for as long as you can. I made this tonight and it was delicious! I substituted chunks of steak instead of ground beef and honey instead of maple syrup but halved the amount. Add some chopped avocado when it’s done with some cheese and sour cream and it’s amazing! Will definitely be making this again! Amazing recipe but you HAVE TO cut the maple syrup by at least half. How does the recipe change if slow cooking in a crock pot? What kind of cheese do you recommend for the topping? Thanks! My husband and I LOVED this recipe. I omitted the bell peppers and used a yellow onion. Used two jalapeños because we like it spicy. Amazing! This is the best chili I have ever made! I make it at least once a month. I do only use half the amount of maple syrup. But 👏 👏 👏. Delicious!!!! Made this chili recipe for the first time for a Chili Cook-Off at work. Ended up in second place! Easily the best chili I’ve ever had, takes a bit more effort to make than most recipes but well worth the effort. I combined this recipe with another chili recipe I made last week and ended up WINNING a chili cook-off for my husband’s Air Force Squadron Christmas party. It’s so good… I’m about to go shopping to get supplies for another batch because I hardly got to eat any of it myself! In our house this chili has now become “championship chili” and “race day chili”, “charity chili”, and this weekend will reign as “super bowl chili”. It is divine, maple syrup and all, and my old, paltry “chili a la packet” is a thing of the past!!! Many thanks for sharing.